So, today I ran around with a bunch of little kids, pretending to be The Doctor (From that show, ‘Doctor Who’). Lately, my oldest brother and me (we’re currently sharing a room) have started this nightly routine where I pretend to be Doctor Who. My acting has a tendency for being… goofy. Well, I thought that this was pretty funny, so the next day I did it again. My parents were taking this two-hour class with a bunch of other adults, and I was helping out in a room of lots of little kids… So I pretended to be The Doctor. I danced around and sang and pretending to buzz things with my imaginary “buzzy device” (aka: Sonic Screwdriver), and all-in-all had a really silly time. Then, later in the day, I did it again. There was a table with a bunch of snacks laid out on it, and I told the kids that I didn’t like pears. (The 10th Doctor doesn’t like pears. I was being the 11th Doctor… Who I assume doesn’t like pears either? Eh, we were pretending.) Of course, I was instantly mobbed by children, who had snacks in their hands that they were pretending were actually pears. I ran up and down the halls with kids grabbing my legs and arms and clothing, shoving food up into my face while they tried to drag me around. Stuff like this went on for a long time, until it was almost time for us to all leave. And then, a little girl walked up to me, with a serious/worried expression on her face. I had been pretending to be The Doctor all day long, and by the end of that day, everyone was calling me ‘Doctor’ and playing along with it all. But it must have seemed pretty real, because she had some suspicions. Dude. I laughed so hard. So, as it turns out, my camera funked up the night before we left to go camping. I had been using it a bunch because I kept re-shooting a video that I was trying to make. It got a little bit hot feeling, the way that computers do when you use them a bunch. But that’s perfectly normal, and it’s done that before. “That’s funny, the screen is black, but the light is still on. Maybe I should click the power button again? Um, it’s still on… Maybe I should click it again, but this time hold it down for a long time? There were lots and lots of kids there. We were camping with several other families, and almost all of them had little kids. Luckily, I’m used to acting the role of big-sister, and I really like playing with little kids, so it all worked out really well. I do this thing for my brothers where I act out a character (usually a robot) doing silly things. It can last for a couple or so hours if we get really on a role, and it’s usually pretty funny. Most of the characters that I act out have silly voices, and their robots from shows like ‘Transformers’ or ‘Doctor Who’. But I make them do goofy stuff that they would never do in the actual shows. Have you ever seen a robot with a high-pitched voice start rambling on about something or other? Or a robot with a funny voice claim that he has read the whole entire Dictionary, while he miss-pronounces the word ‘Dictionary’ wrong at least three times? I would also tell them stories (stories that I was making up right on the spot) of Spider-Man and other Super-Heroes. But get this–the kids were actually really into it. When I told them that I an enemy was sneaking up very, very slowly and very, very quietly towards Spider-Man, they would lean forward and their eyes would get bigger. Spider-Man usually defeated his enemies in these stories by smashing pie into their face. They loved that part. XD Well, um, the kids–not the enemies. And one of the nights that we were there, this little two-year-old girl arrived with her family to camp there too. (I’ll just call her Princess, since she kept pretending to be one.) Well, we said hello, and things escalated pretty quickly. I had this flashlight with me, and it was late at night, so I made a bunch of different shaped shadows appear on the ground. I would make my hand (which was a spider) run up to her on the ground, and she would shriek and jump on top of it, so that the spider was ‘smished’. But mainly I made my hand’s shadow into a dragon, which would chase her and sometimes give her rides and stuff. And she would feed it rocks so that it would grow to be a bigger dragon. Etc. Lots of other stuff happened, too. We ate Smore Cones, (Ice-cream Cones with melted chocolate chips and marshmallows in them) and drank hot chocolate. We talked around the campfire until an Officer came by one day to tell us that we had to put out our fire because there was a Fire Ban on. So we just sat around candles, lamps, and a tall heater after that. Which also meant that we had to roast our Cones in the oven after that. And we exchanged stories. Most of the men there had stories about how their friends or them had encountered grizzly bears and cougars while hunting or camping. I paddled around in a paddle-boat a lot, which was a lot of fun. But we couldn’t swim in the lake because there were leeches in it. (I actually saw a leech or two in the water. They just look like big, slinking, stretching, water-slugs.) So we went to a different lake to go swimming. I also fished at least once, but I didn’t actually catch anything. I had a couple of nibbles, and I hooked one fish, but it got away. I could go on for even longer, but I’m going to stop here. Like any other Sunday, today we had church. Now, most churches are boring, I’m going to just go ahead and say that. Once you get past the 5th Grade, you kiss Sunday school goodbye and sit in ‘Big Church’ with your parents or grandparents or whoever brought you. And then there’s KidsCare. KidsCare is a program that our church does, and it is exactly as it sounds. You care for the kids at the church, help them to feel welcome, if they need someone with them than someone will by their Buddy for that Sunday–etc. I walked in through the baby gate that was barring the door, and there was a little girl who I know pretty well! I won’t say her name, so I’m going to just call her ‘Kitty’, because she’s cute. Kitty was in her dad’s lap, trying to fix a Blue’s Clues puzzle with him, and when I came in he got up to leave. Well, she did not like that, and she had tears to prove it. She forgot pretty quickly though, because one of the adult helpers brought out this toy farm set that had a bunch of little animals and farmers, and her and me got to playing with that. I’m going to change the subject: I really like robots. Now let’s the change the subject back. I looked up from the farm set to exclaim, “Kitty! Why don’t we play Robots? So we got up and started to walk around the Preschool room, pretending to be helper robots for people. We put toys back where they go, and payed attention to some baby dolls, and at one part I started doing this weird little dance while I said in a sing-song voice: “I’m a happy robot! Hap-py!” Which made Kitty start dancing too. Then, when it was story time, I whispered to Kitty that we needed to be ‘quiet robots’, and she actually did it. She was a quiet robot, and she looked at the teacher. All of them did, actually. Some of them kept standing up, but most of them seemed transfixed on the teacher. Next was Craft Time, and the robot thing was still going on. I declared in a robotic voice: “I am a ro-bot. I am go-ing to make a cr-aft.” That made some of the other kids look over at me, which was pretty funny. I’m not sure how long we stayed, but apparently it was a really long time. It felt like only an hour though! And also, something funny happened. After awhile of swimming, I realized that I hadn’t talked to anybody else at the pool, which is really unusual for me. Usually I just walk right up to somebody and launch right into conversation: “Hi, what’s your name? I’m Jackson! That’s a cool name–do you like to draw? I love to draw! What about books, do you have a favorite book? I don’t think that I do–I just love so many of them!” Etc. But for some reason I didn’t talk to anybody accept for maybe a simple ‘hi’ as I swam/walked past. Oh yeah, there were a couple of girls in the locker rooms that I sort of had a conversation with. I told them that I was new and asked if they could tell me where I could put my stuff. The Locker rooms. I don’t remember ever having to actually shower in a locker room before. Maybe it’s just because I’m older now. But for real. I was the only girl in my family in the locker rooms (my mom was off somewhere, it was just my dad and my brothers and me) and I didn’t really know what to do. I’m not sure if your supposed to change in the rooms that actually have ‘lockers’ in them, but just in case that wasn’t what you did–I chose I nice bathroom stall. I was having a great time swimming around and splashing and floating and attempting to swim underwater, when destiny decided to call on me. I looked up to see–against the glare of the sun–a rainbow, and near it, another rainbow. Instantly I yelled: “A Double Rainbow!” Which made the two kids next to me look up. After I pointed out the two rainbows to them, we started joking about double rainbows and then we ended up covering a bunch of other subjects pretty quickly. Did you have to walk here, or drive here? At some point we even started talking about ‘Charlie the Unicorn’, which led to us all making high-pitched voices while we said: “Chaaaarlie, let’s go to Candy Mountain Chaaaarlie!” The name Charlie led us to imitating ‘Charlie Bit my Finger’, and ‘David After Dentist’ was also mentioned. So we basically ran through a bunch of YouTube videos and laughed and talked and held our breath so that we would sink to the bottom of the pool and come back up. Indeed they are. They will tell you right away if they like something or if they don’t, and what they don’t/do like about it. With close-to-zero mercy. Literately. I get a little fidgety when they come up next to me and start to watch me draw. I’m their big sister, and if I accidentally draw an alien robot or a pony wrong in front them, I better cover up my mistake real quick. I can totally laugh it off like it’s all cool, it’s just a mistake, and it’s funny. Which is what I usually do–and okay, mistakes in art can look pretty funny. Or I can purposefully draw something that looks silly. I mean, that’s the kind of stuff that I do just to entertain myself, right? I was drawing a funny Starscream and Megatron Pony picture. 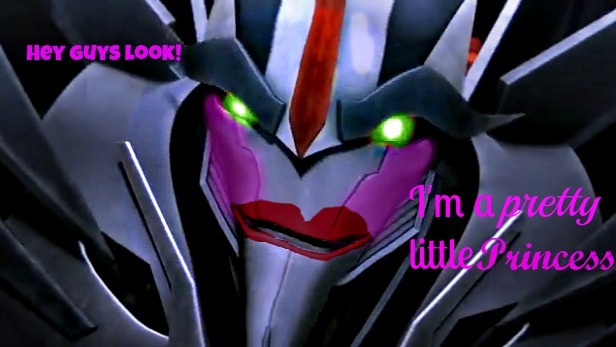 But then I drew this silly little mustache and beard onto Starscream, which for some reason struck me as very funny. So today, while I was working on the drawing that you see above, my brothers also began to draw. Or at least two of them did. One of them kept asking another one of them if he wanted to go play on the trampoline. So two of them sat down at the dining table and began to draw pictures of Minecraft and Transformers. Those two things go very well together, too. Anyways, I should probably point out something else. My brothers copy stuff that I do. For real. I used to not believe it when my parents told me to not act stupid, because my brothers would copy everything that I said or did. But within the last several months, I’ve matured too some amount. And I now see how my brothers copy stuff that I do. Seriously. My brothers were sort of into Transformers before, but they liked other stuff more–like the Avengers. But after awhile of me talking, drawing, watching and even reading about Transformers, they all got a lot more into it. Now Transformers is something that’s talked about amongst us siblings on a daily basis. Whereas last Spring, it really wasn’t brought up very often. And another thing. My Little Pony: Friendship Is Magic. I watched it, and I got drawn into it pretty quickly once I realized that it’s a lot better from the My Little Pony show that I used to watch when I was younger. I used to hide the fact that I watched it, because I was embarrassed that I watched–and enjoyed–a show for seven year old girls. But as I grew to like it more, I began to mention it, and admitted that I had seen a few episodes. But I acted like I didn’t really know all of the main characters’ names and stuff. And now? It’s talked about almost as often as Transformers are, now. My brothers like it, and occasionally watch it. And we make My Little Pony jokes, and laugh at My Little Pony comics on the internet. That’s just another example of how they copy stuff that I do. And finally; drawing. My brothers like to draw, but it comes in spurts. For a week or two, it’s all that they want to do. But then they stop for awhile. But ever since I started drawing a lot more often, they’ve started drawing a lot more too. It’s awesome. Our fridge is now covered in silly Minecraft comics, Transformers pictures, and The Legend Of Zelda pictures. We have to hang our drawings in other places now, because we don’t have much room on the fridge anymore. Now, I guess that this isn’t something that I usually admit, but it actually touched me in a way, when earlier my brothers said that they like my art, and they complimented on my Starscream and Megatron Pony drawing. They are apparently, very good fans of mine. Somehow I ended up with two of each picture–I think that I’ve deleted all the doubles. But if you see two of the same picture anywhere throughout the post, can you please tell me? OK! First of all; sorry for not posting in awhile. I really need to start keeping up with my blogs better! I don’t get around to it enough anymore, I’m always writing in a book, reading a book, or playing on the computer. Or I’m going to some local event in Canada. (We’ve been to a few so far.) However, this means that whenever I do get around to my blog, I have like six or more topics to cover; but I know it’s unwise to post more than once a day and that cramming it all into one big post can be a bore. A bore to me at the least, I don’t know what you think when you read it. I’ve learned how to edit pictures–Have you noticed my blog’s new theme? My mom did that for me, she’s learning how to design graphics. I’m still learning with editing photos, making them look sharper, changing the color and adding things in or cutting things out. For instance, I’ve started to amuse myself and others by taking screenshots of Transformers characters while I’m watching the shows on YouTube, than changing how they look. Mostly I take the evil guys and make them look like they’ve got makeup on. But it works with good guys too. Please note that this particular screenshot is not mine, I just edited it. Now THIS picture I find funny. 😛 That’s Starscream, the Decepticon second in command. A few minutes later, I’m still sitting at the computer, still not listening to anything so I can actually hear everything going around me quite clearly, when suddenly…A really loud fart noise sounds behind me–and I mean really loud! Somehow I kept only two thoughts in my mind while I freaked out; that it was my dad playing a trick on me and don’t turn around and try to hit him. My dad thought it was hilarious and kept bending over with laughter. This resulted in my mom asking what had happened and why she had heard a huge fart noise. About that–My dad didn’t actually fart, he pressed his hands up to his mouth and blew really hard. So, that’s the fatherly scare! If I listen to a song long enough, I’ll eventually learn the words, or at least most of them. So I end up lip syncing to it while I listen to it on the computer. I learned how to use the Webcam and have been trying to take a video of me lip syncing to a song while I listen to it, then adding that same song into the video. 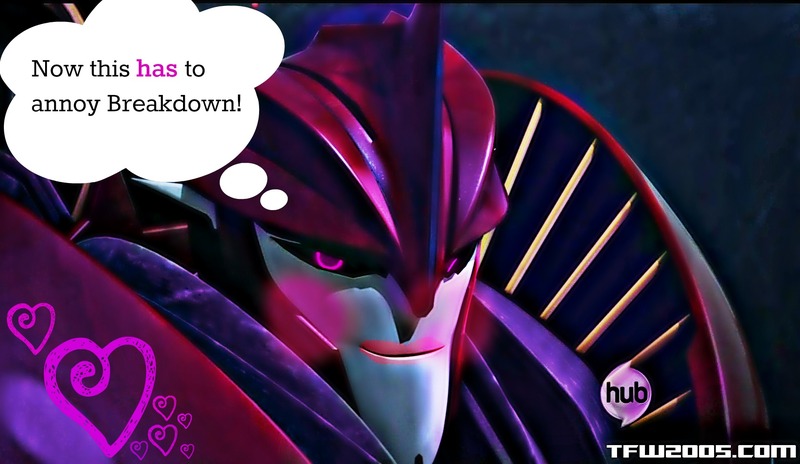 But, I, uh…Only have Transformers songs. But since I really like to listen to it, I decided that I’d make a vid 0f it! 🙂 So I did–several times. But I could never match the song with how my lips were moving!!! Last night after finishing it, I sat there up in my room with the laptop in front of me, laughing at myself. XD! When my mom came to tell me it was time to go to bed, I called her back in and showed it to her. Let me try to describe her reaction to you. Breathless, red faced, laughing and giggling very hard. Grinning the whole time, occasionally laughing. I hope that you enjoyed that 2:03 worth of goofy! Hi there, Thegirlnamedjack here! So…today I’m gonna post some funny videos! Some of them are mine, some of them aren’t. Here is a funny video that isn’t mine. It’s called, “Jellyfish”. Oh…that video is just so funny! Now here’s yet another video not by me! Here’s one of my brother and his friend. Random, yes. Funny, maybe. Short, definitely.